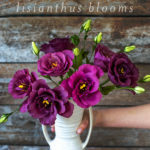 We are quickly falling in love with this project from our growing collection of DIYs for pets. 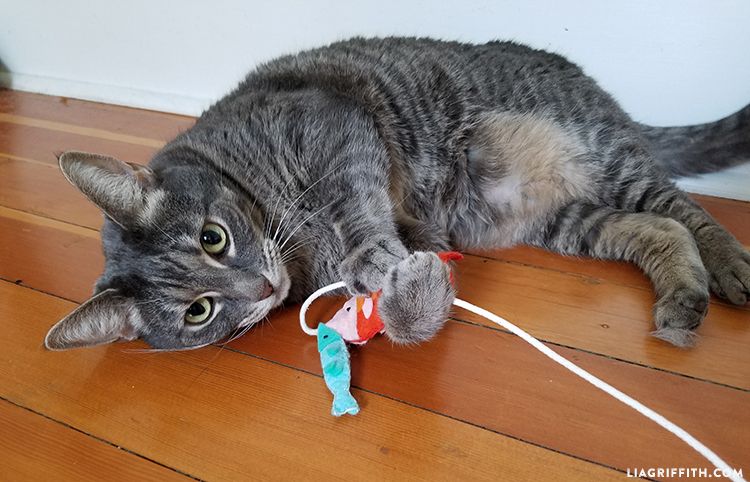 Here is our take on a classic fishing pole cat toy – and we love how adorably colorful it turned out to be! 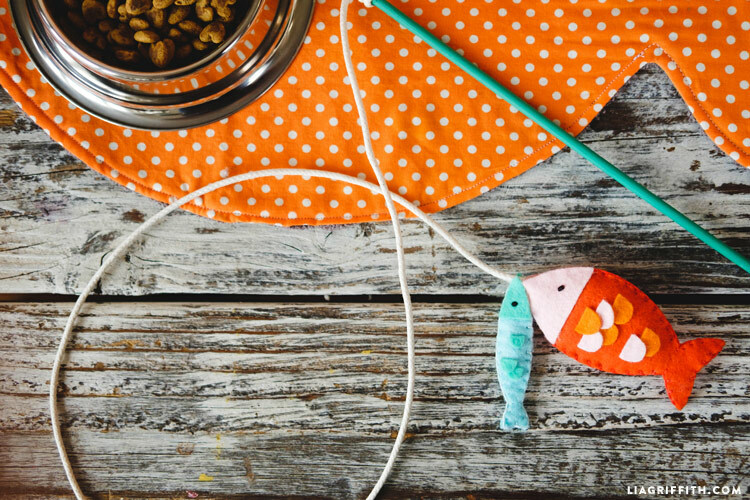 Making this DIY cat toy is super simple, and it could be a great opportunity to introduce basic hand stitching to your little ones. 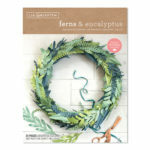 Print the PDF template below and cut felt pieces according to pattern. Glue felt head pieces to the body. 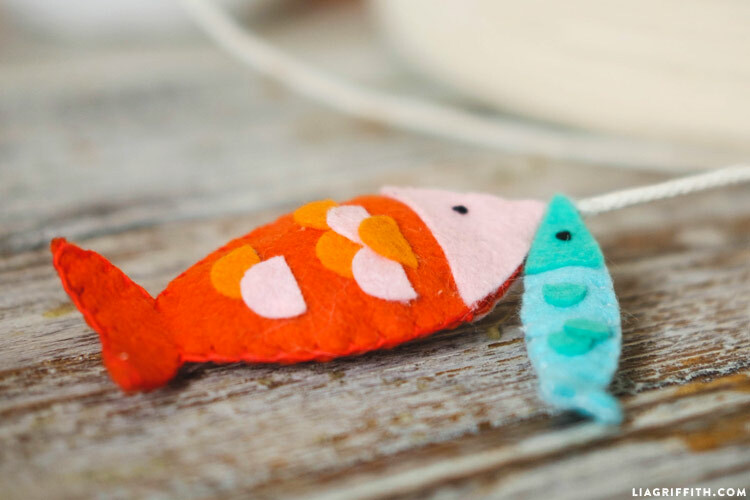 Sew French knots with black embroidery floss to create the fish eyes (see video below for French knot tutorial). 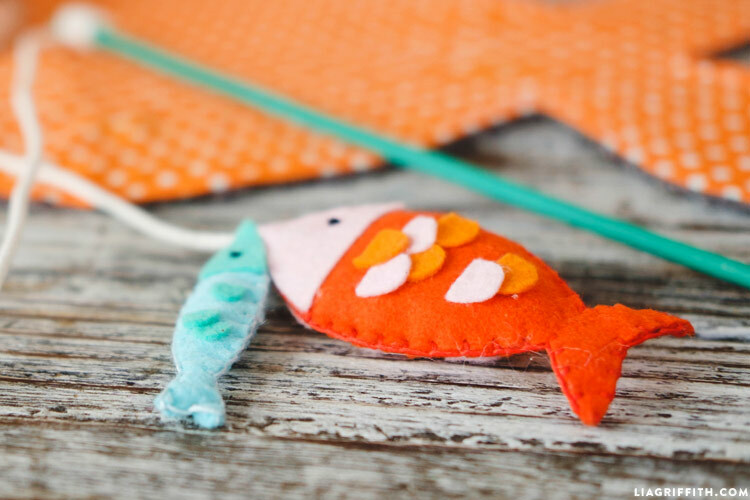 Begin blanket stitching around the edge of the fish with matching floss, leaving a small opening. Add catnip inside. 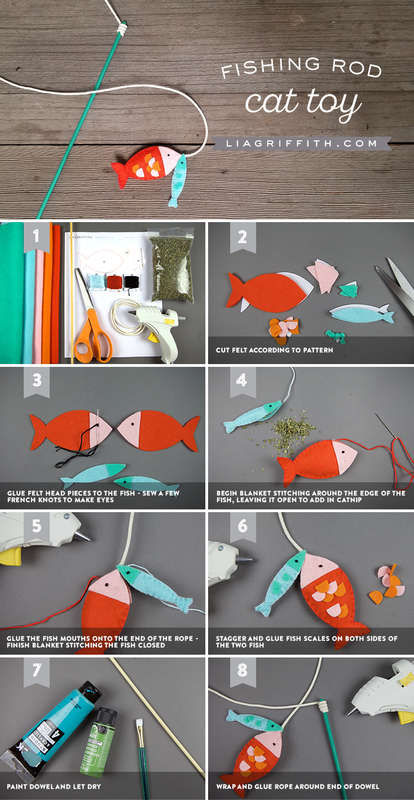 Glue the fish mouths around the end of your clothesline/rope. Finish blanket stitching the fish closed. Stagger and glue the scales onto both sides of the two fish. Paint the dowel in a color of your choice and let dry. Wrap and glue the clothesline around the end of the dowel. 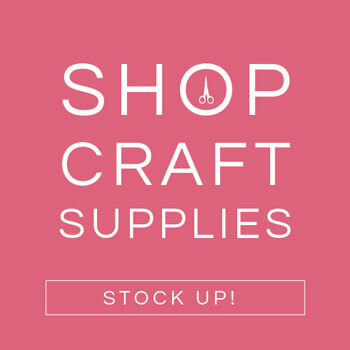 Before starting this project you can head down to your local craft store to pick up your supplies. 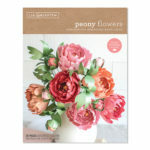 Our favorite felt resources are Benzie Design, Felt on the Fly and A Child’s Dream Come True – all have gorgeous color selections. 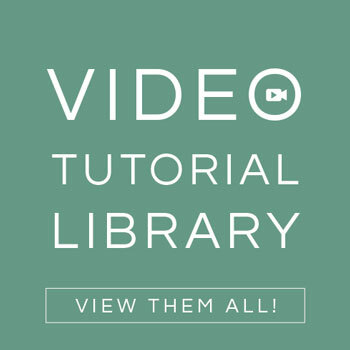 If you want to brush up on some of your stitching skills, find our Felt 101 video for guidance on blanket stitches. 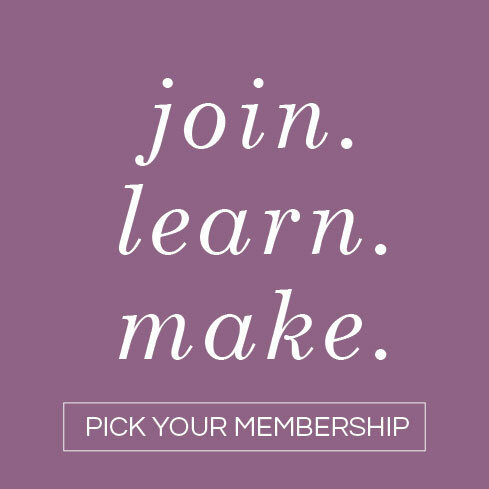 Or, watch our video below to learn how to sew a French knot. 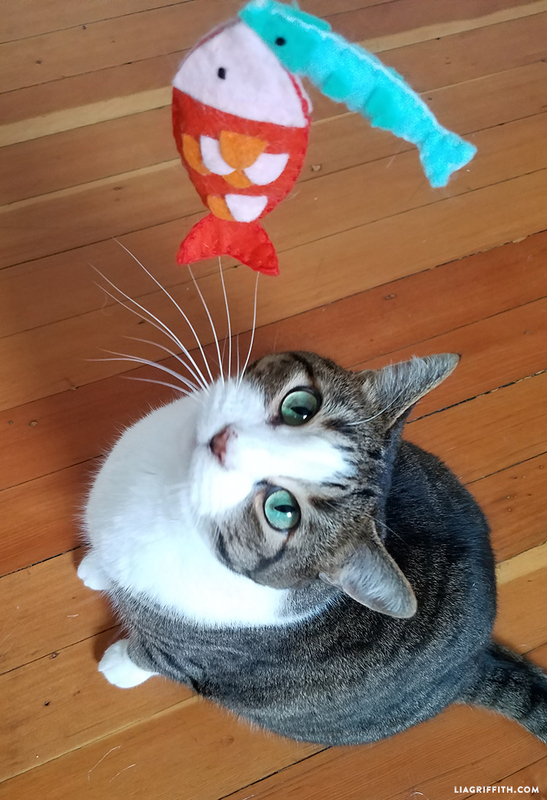 We know that some cats may not be particularly into catnip, so you are welcome to fill the felt fish with poly-fill instead. 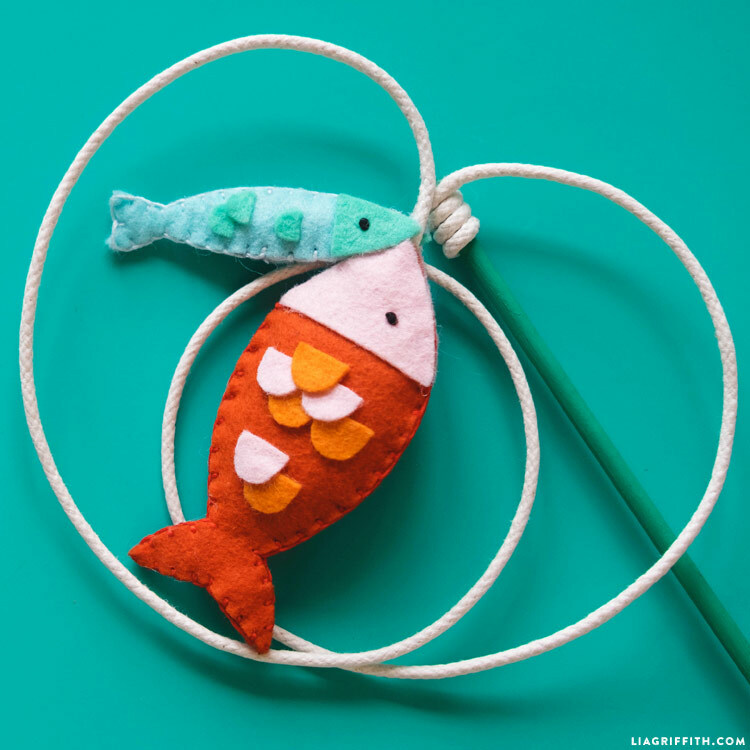 You can also use this fishing pole cat toy template to simply make felt fish!